This year marks the centennial celebration of the National Parks. The 21 Lake Superior islands and 12 miles of mainland that are the Apostle Islands National Lakeshore could knit together under a new federal protection if a group of Wisconsin residents get their way. Around nine months ago, the group launched an effort to establish a national marine sanctuary at the lake bottom that surrounds the islands just off the northernmost tip of Wisconsin. 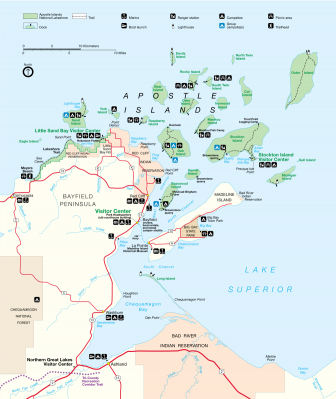 “Our park boundaries only go out about a quarter of a mile around each of the islands and the islands are generally two or three miles apart,” said Neil Howk, the assistant chief of interpretation for the Apostle Islands National Lakeshore. The citizen initiative could give the waters recognition of their own and bring together the area. The islands draw thousands of tourists each year, and the added significance of the sanctuary designation could attract even more. People love visiting national parks and sanctuaries, said Ellen Brody, the Great Lakes regional coordinator for national marine sanctuaries. There is only one designated sanctuary in the Great Lakes basin — Michigan’s Thunder Bay in Lake Huron. An area of Lake Michigan reaching from Port Washington to Two Rivers in Wisconsin was recently nominated as well. The sanctuary designation creates important education opportunities and funding for research, Howk said. Increased funding would also help the public and researchers better understand the waters and fisheries around the Apostle Islands, said Mark Peterson, executive director of Sigurd Olson Environmental Institute at Northland College. “We have big things coming up for the lake,” said Karin Kozie, a biologist serving on the National Marine Sanctuary Nomination Initiative Steering Committee. “Big challenges like climate change and invasive species. No agency is going to be able to prevent all these problems, but contributions to talking and working toward solutions and education and research would at least help us with the best solutions they are able to come up with,” she said. The Apostle Islands and the waters around them are important culturally and benefit wildlife, tourists and Native American tribes, Peterson said. Lighthouses and sea caves attract a lot of visitors, Howk said. The park has more lighthouse and any other national park area — seven light station with nine light towers. To celebrate the 100th anniversary of national parks, the Apostle Islands National Lakeshore is unveiling new lighthouse exhibits on Aug. 25th. 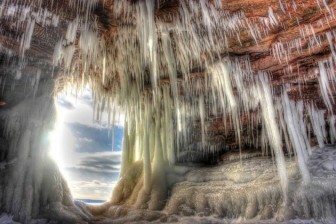 The national lakeshore’s sandstone cliffs and sea caves – also known as ice caves – can be visited whenever Lake Superior freezes over, Howk said. The islands have more than 100 species of plants found nowhere else in Wisconsin and 150 species of nesting birds. Migratory birds rest on the islands and black bears call them home, he said. The bid for the additional protection is unique. There are 14 national marine sanctuaries, but most focus on areas with shipwrecks. Thunder Bay, a sanctuary in Lake Huron near Alpena, Michigan, was designated because of its important historical shipwrecks, said Brody. TApostle Islands advocates say they have a broader interest. “While we have a number of shipwrecks in our waters here, dating back to the 1800s, we believe that we’ve got a far richer story to tell about the history of these waters,” Peterson said. The area used to be the headquarters for the American Fur Trading Co,, one of the largest fur trading companies in 19th-century America. Experts used to select national marine sanctuaries, but now nomination is community based. Public meetings are held and letters of support obtained from local organizations, Peterson said. The community submits the letters and a form that explains why the area should be selected. “The nominator needs to demonstrate the national significance of the resource, talk about partnership opportunities for research and education and demonstrate broad-based support,” Brody said. The number of citizens working to nominate the area has grown to 20, Kozie said. Northland College in Ashland, Wisconsin, agreed to help set up meetings, create a website and organize letters of support, Peterson said. The citizens are going into businesses and organizations throughout the Chequamegon Bay area south of the islands presenting information about why the area should be nominated. “We’ve got some of our first resolutions back now with support and so that’s exciting,” Kozie said. They aim to have 100 organizations and agencies supporting the initiative. But nomination is just whether the area is accepted into the National Oceanic and Atmospheric Administration’s inventory of places to consider as marine sanctuaries. The designation could take three years or more, Peterson said. There are obstacles. The group has to decide how large of an area to recognize. 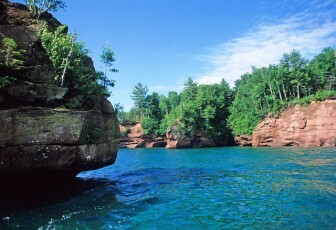 The Apostle Islands National Lakeshore and the Red Cliff and Bad River reservations are possible areas that could be included, Peterson said. The public should collectively decide how much of them include and where the boundaries should be, he said. “This area is the ancestral home of the Ojibwe people and they still live here,” Howk said. 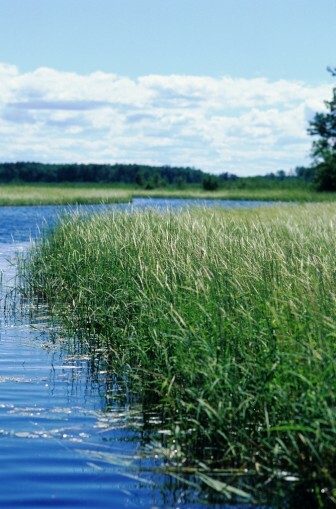 The Ojibwe Bad River reservation includes the Kakagon and Bad River Sloughs, which are recognized as a Wetland of International Importance, Peterson said. They contain rice beds, spawning areas for sturgeon and areas for migrating birds to rest. The citizens also need to decide who will lead the nomination process and submit the 26 page nomination paper, he said. There is also the option to have the community group submit it themselves, she said. The nomination should be submitted to NOAA this summer, Peterson said. This story is part of an occasional series about National Park units in the Great Lakes region during the 100th anniversary of the system. I’m all for this….there is SO much fascinating history in this area of our United States! This area MUST be preserved in its natural, pristine condition for many generations to come! This is such a great idea. I’ve been there many, many times and there is always something new to find and explore. It just must be preserved in its natural state forever.